My son recently got an interesting gift: a Minecraft Stopmotion Movie package. Actually, the box contained the props and then you download the app, and use a mobile device to shoot the stopmotion. He and a friend were working on a short flick this long weekend. While you could do all this without the package, the backgrounds and plastic bricks and characters make for an easier experience. (Although oddly, the intro and outros are preset to be pretty long … sometimes longer than the movie itself, and I wonder if this is a nod to kids’ fascination with those elements of moviemaking). They are still working on how to tell a story in stopmotion as opposed to moving characters around just to move characters around … the teacher in me can’t stand the randomness. But I know I need to just let them do what they do, and play and explore. 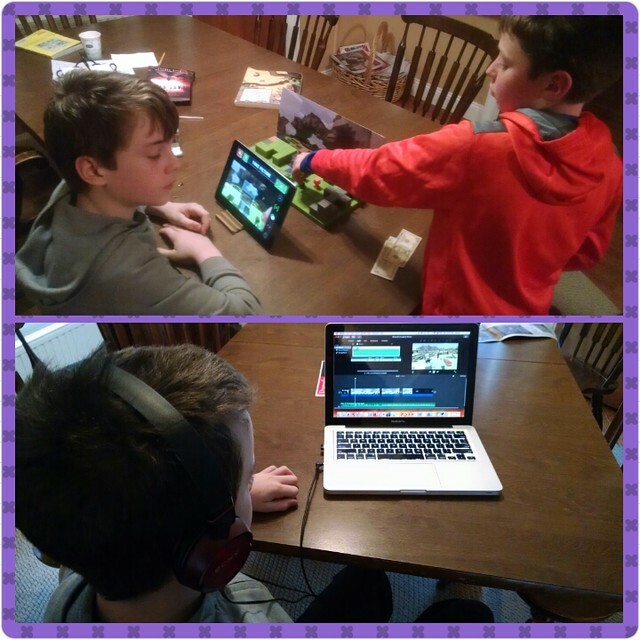 I’ve shown him how to move the video into iMovie, where he can do more editing and add music, etc, so that is the next real step. He already knows the basics there, so it is a rather seamless transition from filmmaker to editor. I have no idea what stop motion movie making is, but I’m totally going to go investigate it. I’ve gotten kids to produce lots of writing and ideas just from my approval of the use of Minecraft. Oh, I know how hard it is to step back and let our own kids do their own thing. And this makes me want to make a stop-motion video! The classes I’m teaching this year aren’t conducive to such creative projects, and I miss them. I love that the teacher is not getting involved! And I love this idea. I go to computer class with my third graders. “We” are building Hogwarts. It is awesome but I would love to bring this idea to the group! Not just teacher — father.